← Ever lose your luggage on a flight? Watch this hilarious video! Pink crayon feels that it’s more of a colour for girls so isn’t used much. How many things are pink? Red crayon feels it’s used too much. Blue crayon complains about being used so much it’s become too short to see over the edge of the box. White writes that it usually can’t be seen unless outlined. Peach is embarrassed. It seems Duncan peeled its paper off so now it feels naked. Yellow and orange are fighting – something about the colour of the sun – so aren’t speaking to one another anymore. This is a funny, well-written story young children should enjoy having read to them, and later learning to read themselves. This reader wanted to know what colour’s note would come next and what problem would be presented. The illustrations are cute and nicely done, with the crayons’ printing like a young child would do. This book by Drew Daywalt was rated as Amazon Best Children’s Book of 2013. 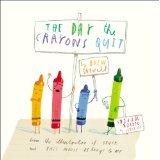 You can find The Day the Crayons Quit on my BUY THE BOOK! page. This entry was posted in Mostly About Reading, Reviews & Interviews and tagged Amazon Best Children's Book, Book review, crayons, Drew Daywalt, Oliver Jeffers, Philomel Books, Picture book, The Day the Crayons Quit. Bookmark the permalink. This is a great book for kids! Yes, and I enjoyed it, too! 🙂 It would be a fun one to read to little ones.